The Ministry of Peace and Reconciliation Under the Cross sought a web presence that allowed them to present their message to the world effectively and with simplicity. The maintenance of the site must be minimal both in complexity and skillset required due to the limited resources of the organization located in small African country of Burundi. The visual appeal of the site was adapted from the organization's newly developed logo and common navigation styles of similar web sites. Colourful and provocative imagery was selected for the header which helps to focus the visitor's thoughts to the purpose of the organization. 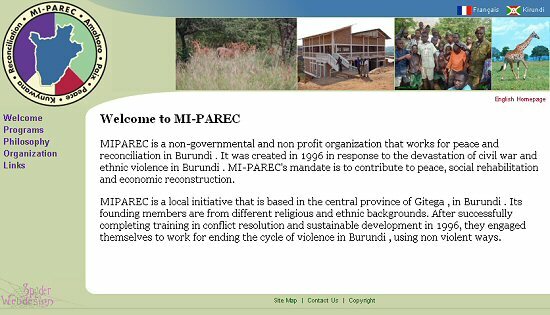 To accomodate the multi-lingual environment of Burundi and the organization, the site is mirrored in English, French and Kirundi languages. Update: The site shutdown in mid 2006 and was eventually replaced a few years later with a new website ( by baseint ).